Wise decisions and careful debt management will reduce your future debt and broaden your legal employment options. A cost-benefit analysis makes the point clear. Our students graduate to work at the same law firms and earn the same starting salaries as those who attend pricey private law schools. But without crippling debt, our graduates don’t have to choose their career path based on salary alone. Consistent with the School of Law's commitment to non-profit work and government service, they enjoy great flexibility to follow their passion for the law wherever it may take them. * Does not include fees and additional expenses. Refer to UB’s Student Accounts Department for the most current information regarding New York State residency. The School of Law offers a wide range of financial assistance to help pay for your legal education. Nearly 80 percent of the fall 2017 entering class received merit scholarship assistance, ranging from $2,000 to full tuition. As New York State’s public law school, we value the contributions that our talented students make to the state and to the legal profession. We want to make our law degree as accessible as possible to academically talented students, whatever your background. We welcome scholarship applications from across the state, the country and the world. Our competitive and generous scholarship program benefits students across all programs. Unlike many schools, UB School of Law does not award scholarships that depend on your academic performance in law school. All of our merit scholarships last for the duration of your academic program, provided you remain in good academic standing. If you wish to be considered for financial aid, you must first complete the Free Application for Federal Student Aid (FAFSA) and submit it as soon as possible after Oct. 1 for the following academic year. The Title IV Code Number for UB School of Law is 002837. Federal Direct Unsubsidized Loans offer a maximum of $20,500 per academic year. The University at Buffalo is a direct lending institution. If you still have financial need after borrowing the maximum in Federal Direct Loans, you may contact our financial aid coordinator for information about other loan options. Federal Direct PLUS Loans are credit-based federal loans that graduate or professional degree students can use to help pay education expenses. More information can be found on the Financial Aid website. Perkins Loan and College Work-Study are campus-based aid. Students are automatically considered for both if the FAFSA is processed by March 1. Awards are based on need and availability of funds. Scholarships, grants and fellowships – available through bar associations, community groups and national organizations – do not have to be repaid. We encourage you to learn more about the sources of funding listed below. AAUW Selected Professions Fellowship - This fellowship is open to women in certain degree programs where women’s participation traditionally has been low. This opportunity is for third-year students only. Economically Disadvantaged First Professional Study (EDPS) Program. The Economically Disadvantaged First Professional Study (EDPS) Program is a partial tuition waiver program funded by New York State in conjunction with participating educational institutions. This program provides partial tuition waivers to full time Medical, Dental, Pharmacy and Law students who are pursuing graduate or first professional degrees, and who are determined to have exceptional need by the Financial Aid Office. 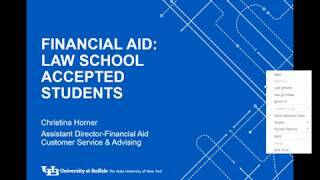 Visit UB Financial Aid for additional information. Because we are a public law school, our in-state tuition is very affordable. Out-of-state residents pay a slightly higher tuition but are eligible to establish New York residency for their second and third years of study. If you are an out-of-state student, consider changing your permanent state of residency to New York. To qualify for in-state residency, visit UB's Student Accounts and complete the Application for Residency for New York State Tuition Purposes (PDF).